To save shipping and manufacturing costs, customers can submit a request for a License to Manufacture one or more of Westfall’s patented Static Mixers in their country. For example, Linde Engineering won the contract to build a gas terminal in Germany for the Norwegian company Gassco. They chose a 48′ Westfall pipe mixer, Model 3050, but the cost of shipping the completed pipe mixer from the US was prohibitive. Westfall provided a License to Manufacture for the mixer along with the complete production drawings. 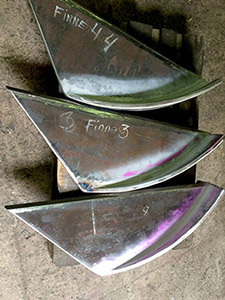 The mixing vanes were built in Germany, where welders installed them to Westfall and German specifications. 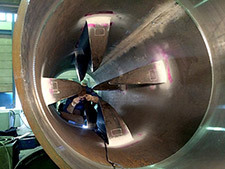 The welding and mixer housing were tested and verified by an independent outside German engineering firm hired by Westfall. In this way Linde was able to save money and time, and meet stringent German building codes every step of the way. Contact Westfall for specific details. Westfall’s Static Mixer Model 3050 vanes were manufactured in Germany, welded into place and inspected prior to installation in a Gassco underground natural gas pipeline. The CFD and FEA analyses gave this static mixer a predicted service life of over 30 years. Pipe wall thickness is 38mm. Patented vanes for Static Mixer Model 3050 manufactured to Westfall specs in Germany under a licensing agreement for this one application.